The Garmin D2 Bravo is the improved version of its predecessor the D2. Through the update it offers some new functions and improved performance: The stainless steel EXO antenna, for instance, provides even more accurate GPS positioning at a fast velocity. 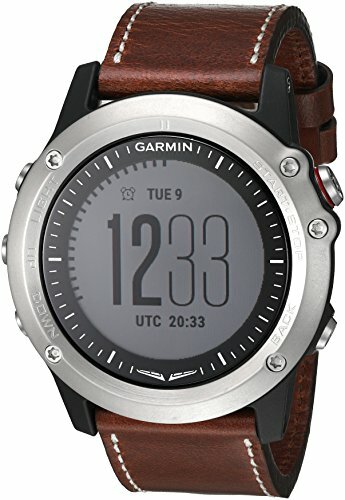 Once again, Garmin showed with this multifunction watch that they are still leaders in GPS services and sports. The D2 Bravo offers advanced navigation capabilities in an elegant and thin design. The Garmin D2 Bravo counts on a high-resolution LED screen. Garmin’s engineers developed a special watch where the color screen is sunlight readable. 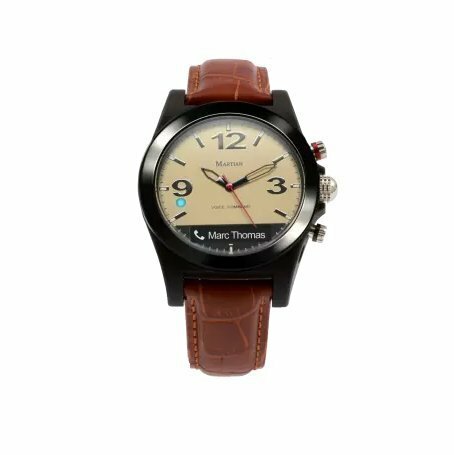 The round black face watch looks sporty while still highly stylish with its leather strap. This 100 m waterproof full-featured sports and fitness watch with a battery duration of 20 hours, counts on such a comprehensive range of features that make it stand out among the competitors. 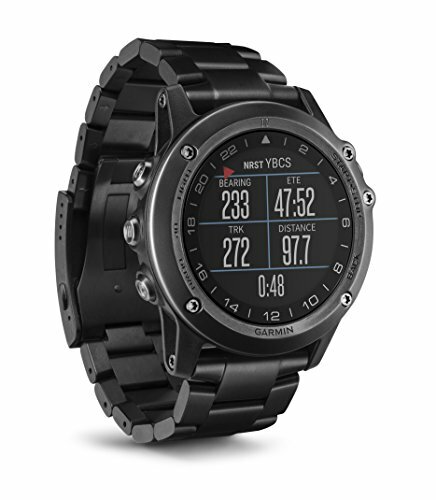 In addition to the GPS functionality, it includes a barometric pressure altimeter, a digital compass, a nearest airport indicator and a moving map. When paired with a tablet or smartphone, with the Garmin Pilot flight app it can send updated weather data, including METARs and flight plan information (among others). The D2 Bravo also comes with a pressure sensor and vibrates every 30 minutes when flying above 12,500 feet to remind that supplemental oxygen is needed. In our eyes, this watch provides a unique functionality for a wrist-worn device. Of course, similar to other smartwatches, the D2 Bravo keeps you in the loop. It shows alerts for incoming emails, phone calls and text messages. As a bonus, the pilot watch functions as a remote control for the VIRB camera, a single tap on the smartwatch starts or stops the recording. In summary, if you are seeking for the best smartwatch for pilots, the D2 Bravo should not be neglected! Smartwatches are being designed to cater the different needs of the public. Luxury brands adapted themselves to the new demands of the market. Sophistication and creativity in smartwatches industry keep reaching new levels which you can see in the highly evolved Garmin D2 Bravo Titanium. New features of the Garmin D2 Bravo Titanium edition are a titanium band, a high-resolution display and a heart rate sensor. Create individual screens with Garmin’s App as you need. Not only the design of the band and the housing changed but overall the D2 Bravo Titanium is now even thinner and lighter. The D2 Titanium is multisports compatible so you can go for your favorite activity like golfing (See also our best wearables for golfing) or do your daily fitness workout. The prestigious Breitling brand stepped into the world of smart wearables too. Maintaining its traditional roots in the quality watchmaking industry, Breitling presented this pilots-focused watch and chronograph. 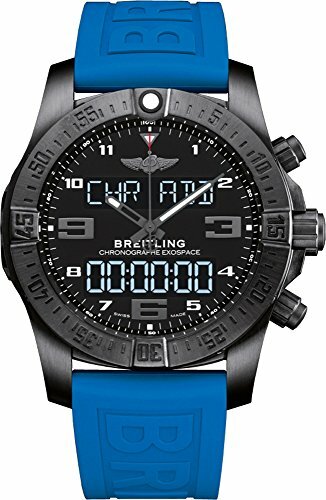 If you are a pilot, and watches are one of your weaknesses, then you will never regret buying this watch! The Breitling Exospace B55 comes with an analog and digital display. This pilots watch is keeping its timing accuracy intact with its SuperQuartz technology which is ten times more accurate than standard quartz. The appearance of this Swiss-made smartwatch maintains the distinction of the brand. 10 times more accurate than standard quartz. Design minimalists will love that there is not even a micro USB port ruining its line; the Li-on battery recharges through a magnetic connector. The sporty touch is given by the rubber-type straps. As you know, Breitling is known for its sophisticated high-quality materials. Just take a look at the watch housing which consists of superior titanium grade. As a special feature, this smartwatch will notify you of incoming messages, emails and phone calls, as well as remind you of upcoming appointments when paired with a smartphone. The Aviator watch face for Android is an excellent way to turn your Android Wear powered smartwatch into an awesome smartwatch for pilots. It is a watch face that combines the style of aeronautic watches with the technologic functionalities of modern smartwatches. The pilot watch face offers superior readability, features a battery indicator, shows weather conditions, and date and day of the week. Customizing your Android Wear’s appeal allows making your smartwatch a special and unique one. That is something you can achieve for a minuscule price, and transform your smartwatch into an appealing aviator’s watch. We intended to introduce you to five entirely different options if you are looking for the best smart watch for pilots. Depending on your needs, preferences, and budget, with these five we have you covered! 7 Top Misfit Accessories you didn't know exist! Replacement Battery fits your Smartwatch, Wearable or Fitnesstracker?